It is fitting that the acronym AGAPW, which stands for Association of Greek American Professional Women, spells I LOVE in Greek. “As its name indicates, AGAPW is about love: love of our family, our community, our country, and homeland,” says Dr. Olga Alexakos, who founded the not for profit organization. This year’s scholarship will be awarded at AGAPW’s International Women’s Day celebration, on March 8th when Mrs. Loula Loi Alafoyiannis will be presented with the organization’s “Greek American Woman of the Year” award. This is just the beginning. 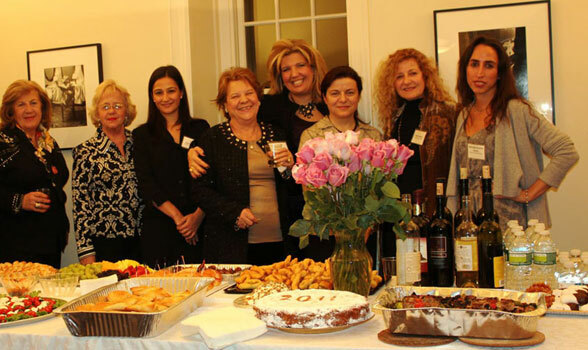 As the organization grows, AGAPW aims to raise more funds for various scholarships with the aim of helping Greek American women work and improve their quality of life in the U.S., Greece and other areas of the world. The articulate Ms. Alexakos spoke with the Greek News about her hopes and the goals of AGAPW. GN: What is the purpose of each AGAPW event? OA: Each AGAPW event offers an opportunity to share our resources and talents and to support one another. Whether it’s art, entertainment, financial analysis, intellectual or informational discussions or Greek food and so on, we all share from each other’s resources and talents. Each AGAPW event is also a celebration. There is something very positive and uplifting in all our events. I grew up in a small village in Mani where the whole village was like a large extended family…. I see AGAPW growing into something similar. It’s amazing to watch the synergy that takes place, as our events are being prepared and coordinated. Given our very limited resources, our events involve so many people who each contribute something to make the event happen…. just like a village. It is a lot of work, but it is also very rewarding. GN: What inspired you to found AGAPW? OA: Honestly, my extended family of lifelong women friends, years of Women’s Studies for my Ph.D. degree, my Greek Orthodox upbringing and faith–which has taught me to care for my neighbor as much as I care for myself–and not least, the monthly networking events at AVRA and Kellari Parea by AHI’s Antony Neroulias, Dean Sirigos, and WSMHPS’ Manuel Russon, respectively. I started attending those monthly meetings about two or three years ago and was truly inspired by the caliber of people who attended and the variety of their backgrounds and interests. I felt the need of people, as well as my own, to come together as a community. Women friends, especially, expressed a need for a women’ s organization that would embrace many different women of the community…. there was a big empty space where a women’s organization could be. GN: What does coming together as a community mean to you? OA: As my generation is turning older, we are becoming more aware of how important it is to support one other and also to assist the young members of our community who are starting out in life. GN: Did the nation’s economy play a part in this thought? OA: With the sudden economic crisis in the fall of 2008 I watched as so many of my friends and acquaintances were losing their jobs; it became obvious that we needed to come together as a community to support each other. The crisis in Greece reinforced that belief. There are so many resources available in our community yet there is so much need. I am taking courage in knowing what we can accomplish together. I must say that it has been easy and difficult at the same time. Many important people in the community have seen the value of this organization and have supported AGAPW; we are nurturing a culture of collaboration and caring, but it takes time. GN: In what ways do you, personally, hope the organization will develop? OA: AGAPW is barely a year old; we are still evolving. I hope and pray that AGAPW will grow roots and branches in the community in a way that unites all of us–each one of us–as an individual, and all of us as a community. I hope and pray that AGAPW will have a life of its own for generations to come. By bringing women of all different backgrounds and age groups together in constructive ways there is no limit to what AGAPW can accomplish. GN: How are the costs for AGAPW events covered? OA: When we started AGAPW about a year ago, we in the Founding Board of Directors pretty much covered all the expenses ourselves, spending our own money. In the process, we’ve had a lot of volunteers who made donations in kind, from opening their homes and offices to AGAPW events to donating or cooking food, and, of course, volunteering their time and skills. As the organization becomes solidified and better known and more people in the community are getting to like and trust what we do, we hope to be able to raise more funds so we can continue to offer varied events free of charge–or at a low cost when free is not an option, so that people of all means can attend—to serve the community effectively. So far, we have been very successful. The needs are many, but the resourcefulness of Greek American women is extraordinary! GN: How will the organization expand career opportunities? Is networking its primary tool? OA: By connecting people with each other and connecting them to resources. Networking is only one of the ways. As a charitable and educational organization AGAPW aims to advance career opportunities through internships, educational lectures, symposia, seminars and workshops, and reaching out to students by offering scholarships and seminars and helping locate internships. Women of all ages can promote their businesses and talents through our events, while at the same time they give back to the community. There is also a lot to be said about inspirational role models. Our new website will offer women and men of our community the opportunity to exchange resources through direct postings. GN: How will the organization promote community and leadership building among Greek American professional women? OA: By fostering a sense of community awareness and engaging women in various projects…. this does not just involve attendance; it involves participation in organizing the events. Much effort, collaboration, skill, and resourcefulness goes into preparing an event. Each event is really a great example of teamwork and effort. And the collaboration does not stop when the event is over. Friendships and business relationships that have started at the events are often long lasting. Many women in the community would like to organize lectures, seminars and workshops, and share ideas in many different areas of expertise; this is also a great way to build community and leadership. The welcoming response we have been receiving is a great indicator of the need for such an organization in our community and for the positive role AGAPW has already been playing and will continue to play. GN: How will the organization establish partnerships with other organizations inside and outside the Greek American community? OA: Primarily through collaboration and participation in the events we organize. For example, in our upcoming March 8th International Women’s Day celebration we are collaborating with the European American Women’s Council (EAWC). In our upcoming May photo exhibit and presentation on Greek Armenians–most of who are of Pontic descent–will be collaborating with various Pontian organizations as well as with Armenian organizations. 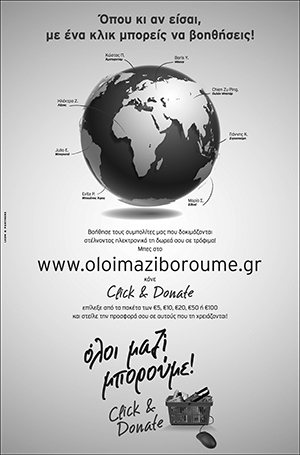 We are also reaching out to Greek Cypriot American women and are receiving their support in return. The Washington DC-based Next Generation Initiative has helped us get in touch with Greek American student organizations in New York so that we can reach out to students of Greek descent. We hope to further increase our collaboration with organizations within and outside the community as the organization grows. GN: Many men attend your gatherings. How do men fit into the scheme of the organization? Will their participation be limited? OA: AGAPW is an independent organization started by and run by women, and with women as its focus. Our Board of Directors are all women. We recognize, however, that men are part of our lives, families, communities. In the beginning men were a little shy about attending our events, but once they realized that the events were really open to everybody, they have been joining us in considerable numbers. I am very proud to see the men of the community be so supportive of our efforts. I think their support reflects their love for their families and their Greek heritage. GN: The AGAPW manifesto states that the organization “begins to fill the void of communication and support among Greek American women who seek to work and improve their quality of life in the U.S., Greece and other areas of the world.” How will AGAPW affect Greek American women, women in Greece, and other areas of the world? OA: This connects again to the concept and goal of community and leadership building among women. Our events are the means by which women of Greek descent can come together and build a community. A good example of this is our upcoming May photo exhibit and presentation on Greek Armenians by Dr. Marina Mkhitaryan, whom we invited to come to New York from Yerevan, Armenia.. She will bring with her photographs of Greek Armenians and she will also be like a cultural ambassador from her Greek community in Armenia. She has dedicated her work to her Pontic mother and will bring the pulse and history of that community with her. Another example: during our symposium “Greek American Women in the News Media” last October, Greek Parliamentarian, Dionysia Theodora Avgerinopoulou, shared with Greek American women the spirit of many Greek women when she spoke about the role of Greek women in the media and the impact of the media on the lives of women. There are many requests from women in other states, especially the East Coast, to expand AGAPW to their communities. As the organization grows and expands we hope that our network within the States, as well as abroad, will broaden along with our resources and our ability to reach out and serve the needs of more women in our community…. and by extension our community itself. AGAPW has a strong belief in promoting education and service to the community.